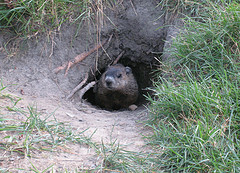 Groundhogs, kin to squirrels, are vegetarians and can eat a lot. Their Autumn-prehibernation activities include lots of eating and that means our gardens are at risk of damage. Groundhog appetites are at their peak when our vegetable gardens are ready for harvest. They are know to take down a whole garden before moving on to your neighbor’s yard. Meanwhile, they dig and can collapse your yard with their tunnels and burrows. But don’t fear, there are many ways to get rid of Groundhogs. Not all are humane; not all work, but use your judgement and try what you want. Hopefully you can find a way that works for your yard. Below is a list of suggestions. Some people suggest planting a Groundhog garden and let them eat there. Why? Don’t you just want them out of your yard? I do not suggest this…what a waste of food that your family or friends could eat instead. There is a device you can stick into the ground that, with battery assistance, vibrates the ground and causes Groundhogs, Moles and more to scatter. I have them in my yard. They were placed there by the previous homeowners and I’ve changed out the batteries but I do not believe they work. Destructive Moles are regularly very active in all sections of my little yard. My sandy soil may prohibit the vibrations from traveling through the ground. These devices only work in certain soils so if you want to try them, and I suggest more than one for your yard, read up on soil types that are best suited for the device. Groundhogs are not to be found along the Gulf Coast. The closest habitat would be central Alabama and the northern third of Mississippi so Gulf Coast gardeners need not worry about this animal eating this year’s harvest. The only worry anyone along the Gulf Coast might have is whether or not the official Groundhog sees its shadow on February 2nd. I hope it does. It’s currently Mardi Gras season along the Gulf Coast and a sunny day is a great day for a parade. Previous Post Is There a Bustle in Your Hedgerow?